Our spiritual lives depend so much on our communication with the Lord. When we take time off everything else and give Him our attention, He fellowships with us. 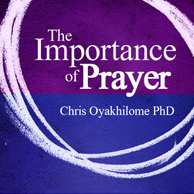 Learn from this teaching the importance of prayer and fellowship with the Holy Spirit, and the glory of God will be manifested in your life.